Remember the Nineties? It was an awesome time for essentialists. National chauvinists briefly got the upper hand in politics in the region, told knowledge-free internationals that their extreme politics were a product of nature (which functions differently in countries you know nothing about, dontcha know), and got away with it. As a result we had years of apparently serious discussions about what was being done by “the” (insert nationality here) to “the” (insert slightly less despised but disparagingly pitied nationality here). One guy even had something close to a bestseller with it. Remember Robert Kaplan? He was a guy who talked to a bunch of taxi drivers who managed to persuade him that everything was caused by ghosts. Then he wrote this bizarre book that projected his fantasies about geography onto the faces of people he described. In between play sessions with his cigar, even the president of the United States read that book. Dependably, big news creates a good scene for charlatans. That story about how everyone on a particular territory was always unified by the same bad ideas looked pretty saleworthy for a while. It certainly provided a useful lesson to predatory politicians: whatever you want to get away with, pitch it as a response to the nation being threatened. That way everybody will believe everything and nobody will demand anything from you, least of all that you respond to the public’s needs. The nationalists’ claim to a monopoly on public sentiment was always bogus, but for a period it was a successful political strategy. If anyone was looking for a sign showing that it no longer is, look no farther than some key protests of the past month. First in Belgrade, a group of right-wing parties joined up with a politicised faction of the Serbian Orthodox Church to organise a protest against the agreement that had been signed between Serbia and Kosovo. Not too many people turned up, but the ones who did were in for a surprise. One defrocked bishop offered a thinly veiled death threat to the prime minister, and a serving bishop acted as though the death threat had already been carried out, performing a funeral oratory for the government. The response was not delight. The prime minister garnered a good load of sympathy by asking what God had done to deserve such earthly representatives. The head of the Church rushed to declare that neither he nor the Church had anything to do with the bishops’ shameful performance. In one analysis Sonja Pavlović characterized the overreaching of the bishops, following on a series of scandals involving shenanigans of all kinds in the Church, as a “death blow for the extreme right.” Meanwhile the satirists at Njuz.net had “hooligans abandoning the meeting in terror” following the bishops’ addresses. There was a time in Serbia when hatred and fear provided a pretty reliable recipe for political success. It’s not working anymore, once people have been offered a chance for peaceful settlement and a bit of hope. The politicians who decline to learn the new rules can look forward to a long and well deserved sojourn in the wilderness. 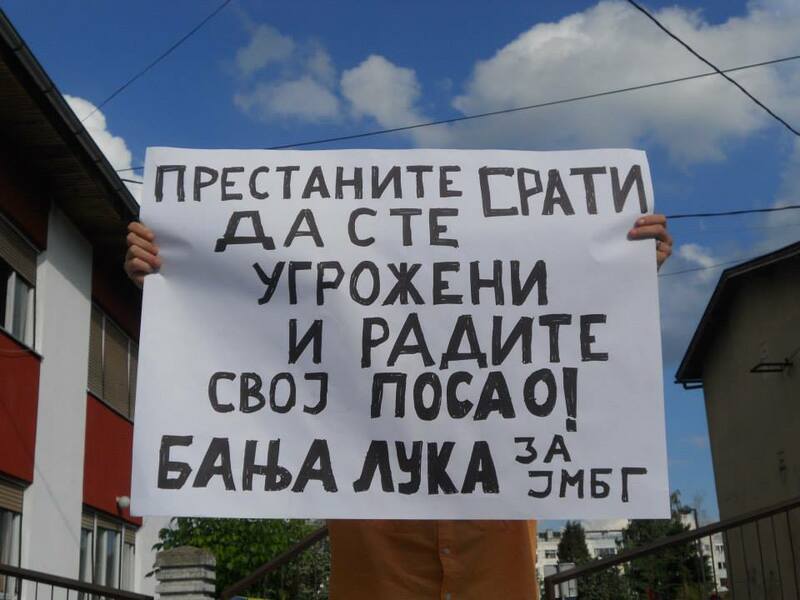 Then this week in Bosnia citizens began making their point again. The catalyst was the health of Belmina Ibrišević, a three-month old girl urgently requiring medical treatment that is only available abroad. But she could not get it, why? Because she could not get a passport or an official medical record, why? Because the representatives of the two entities that make up the state have been unable to agree over control of the issuance of identity documents to new citizens, and have not issued these documents since February. First citizens in Sarajevo came to protest at the parliament, eventually surrounding the building with a human chain and telling the parliamentarians inside that they would be let out of the building until they resolve the problem. The parliament responded with a “temporary solution” that would allow an ID number to be issued to the baby girl in question. The protestors rejected the move and demanded that the parliament agree on a way for the state to accomplish the simplest and most essential job it has. With dramatic exceptions, among them the chair of the Council of Ministers Vjekoslav Bevanda who surrounded himself with bodyguards and muscled himself out of the building to a waiting car, smacking concerned citizens out of the way, a good number of the parliamentarians were willing to comply with the protestors’ demands, particularly as groups of celebrities, artists, athletes and Sarajevo’s mayor came by to support the protest. A more dramatic exception was provided by a group of RS deputies, loudest among them Aleksandra Pandurević, who claimed (falsely) that the protest was aggressive and directed against Serbs, and who sought guarantees of security and armed escorts to get them away from their workplace. A group of special forces police made their way over from RS but thankfully any potentially awful incident that could involve them was avoided. Pandurević herself, together with her colleagues who claimed to be threatened, were ridiculed universally, by people of all nationalities in both entities. Again, real interests were at stake. Nobody was prepared to believe that an expression of disgust at an entitled political class unprepared to protect (or even officially acknowledge) the state’s youngest citizens was anything other than what it was. The effort to turn it into a national incident failed. If the old days ever were what they appeared to be, they are over now. The national game is up. When it worked it produced a generation of politicians who believed that firing up resentment and fear would give them a permanent hold on power. It’s ringing hollow and their permanent mark is fading. They have become objects of ridicule. They’re over. Tags: Bosnia, protest, Sarajevo, Serbia. Bookmark the permalink. An encouraging straw in the wind or just a sign that the boundary between the real world and fantasy football lies out on the remote margin of political inhumanity? Well written analysis of an ongoing process. Author shows deep understanding of actual situation and events, seldom found even in local media.